Cougar Mountain Support Blog - COMPUTER TEAM, INC.
Cougar Mountain released an update to Denali version 3.2 with it's service pack 12 today. This should be installed as soon as possible to take advantage of all of the updates. If need assistance please call our support staff at 800-355-0450 or 563-355-0426. If you want or need to find out about a specific fix please call our support staff at 800-355-0450 563-355-0426. 0426. If you want or need to find out about a specific fix please call our support staff at 800-355-0450 563-355-0426. Get Deanli to run in Windows Vista, 7, Server 2008, Server 2008 R2 without having to disable UAC (User Access Control). Normally when setting up Cougar Mountain Denali to run in the newer operating systems like Windows 7, Server 2008 and Server 2008R2 you must shut down the User Access Control feature that is there to try to protect users from harming their computers. It is sometimes more desirable to left that in tack. So, to allow that to happen we have found a registry editor change to correct this issue. 1.) Go ahead and install your Cougar Mountain Denali on your server or workstation following the recommendations from Cougar Mountain software. 2.) Once this is completed open your registry editor. If you are not familiar with this you should defer this to a professional since editing the registry can disable the computer or server. 3.) For a 32Bit operating system make the following changes to the registry: a.) Find the following key: Computer\HKEY_LOCAL_MACHINE\SOFTWARE\Cougar Mountain b.) Now change the permissions to allow all of your user’s full access. 4.) For a 64Bit operating system make the following changes to the registry: a.) Find the following key: Computer\HKEY_LOCAL_MACHINE\SOFTWARE\Wow6432Node\Cougar Mountain b.) Now change the permissions to allow all of your user’s full access. As it turns out a bug introduced to this report, sometime this year can cause figures to be inaccurate because of missing employees. As most of you know Iowa and Illinois have a reciprocal agreement between the two states about SUTA State Unemployment Tax. This agreement is the only one in the entire United States of course. The agreement states that employers will pay state unemployment taxes on employees based on where they work not where they live. So therefore, if you are an employer in Iowa and have employees in Illinois you will pay Iowa unemployment tax for the Illinois employees. The opposite is true for Illinois employers. You will pay Illinois unemployment tax on your Iowa employees. 1.) Open your Cougar Mountain Professional Payroll. 2.) Go the options menu at the top of the screen. 3.) 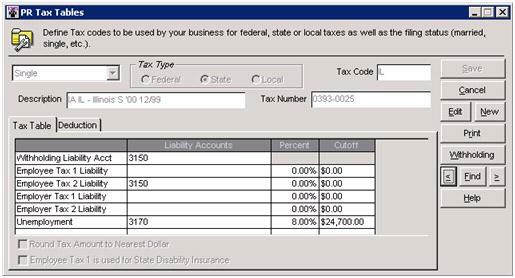 Select Codes and then Tax Tables. 4.) Find the tax code for the state that applies to you. I will be using Illinois in my example. Once you have the tax table record on the screen, which looks like the one below click edit and add the IA to the beginning of the Description field. Once completed it will look like the second screen below.